can get between us and God’s love because of the way that Jesus our Master has embraced us. Nothing can separate us from. God’s love. I got a graphic glimpse of this revelation when I watched the movie The Passion of the Christ. turn Him away from the path that lead Him to the cross. A death which separated God from part of Himself, because He couldn’t stand being separated from US! Think about that. God so loved us… part of His own family was put to death for our sin, because He couldn’t show us His love in any other way but the best- setting us free and taking back the keys to His kingdom. Demonstrating that love in a display so amazing and so powerful it ripped the separation between us forevermore! Love is not such an easily exchangeable word once you encounter His love. Love comes with a price: being vulnerable before the one you love, and opening yourself up to the fact they may not love you in return. This love God has for us? This love Jesus displayed for us? This love Holy Spirit stirs in our hearts? God loves all of us, each and every one of us, whether we receive it or return it, always. Imagine loving, and knowing who will love you in return. How my heart aches knowing He loves every single person ever, died for each one, and knows that despite all His efforts to reach us with that love, some will ignore Him, brazenly break His heart with their actions and deliberate turning from Him. No lover enjoys when someone turns away from you, changes their mind, cheats on you or abandons you. No parent relishes the pain their kids go through when they refuse your help. The weight of His love must be huge in its enormity, yet His love remains unstoppable in His pursuit of us all. Once you decide to accept His love, there is nothing that can change His heart for you. Nothing, ever, can change His love for you. There is no place you can hide or run where His love won’t find you. He will have already run to greet you there with wide open arms. If you are His, you will be loved by Him now and into eternity! Once God decided humanity was in His plan, He never looked back from His love for us. Take a moment today, and think over the cost of His love for you today. Lent is a season of seeking Him, and historically giving up in order to see Him anew. Give up your false belief that you are not worth His love this Lent. 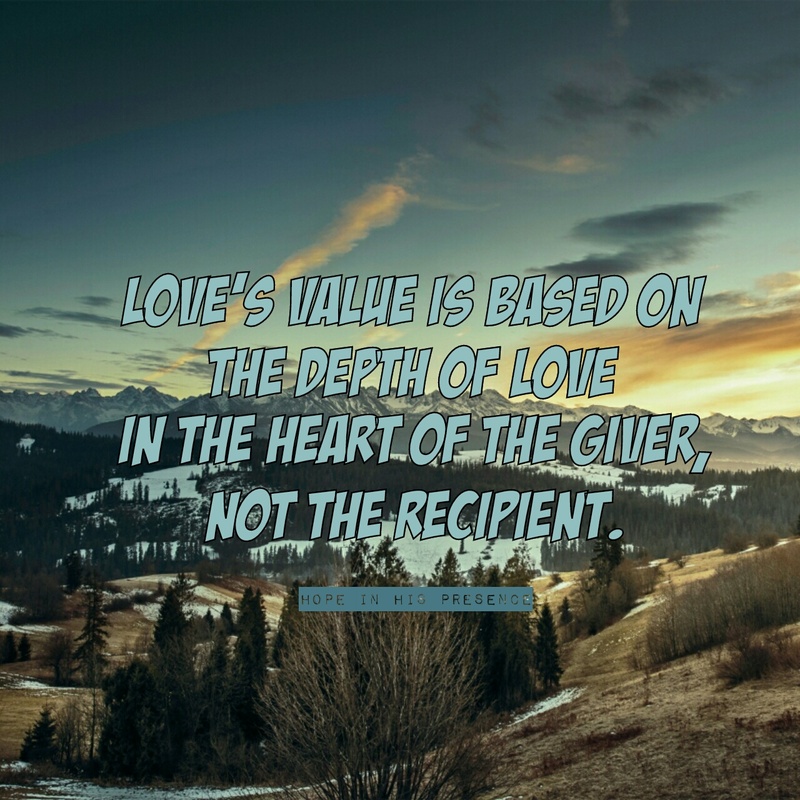 Love’s value is based on the depth of love in the heart of the giver, not the recipient. You are His beloved, and He will never stop singing that love over you, showing it to you or pouring it into your heart for the rest of your life, and into the next! Next what to do when you catch a glimpse you prefer you hadn’t?